If you want to discover a bit of the real Romania, run away from the dusty capital city and get to know some of the country's natural beauties while diving into spirituality and history, then the painted monasteries in Moldova are a great choice. Suceava is 436 kilometers from Bucharest – the two-lane road is good on most of the distance and it will take you around six hours, or a bit more if you stop along the way, to get to Suceava. At Buzau, Focsani and Bacau you will find shopping centers on the towns' bypass roads, if you want to stop for shopping or to have a coffee. your own car, you might need to take the local transport to go from one place to the other and this could be an adventure in itself. Your choice in terms of public transport are buses or the slower, 'personal' trains. The 'personal' train is the slowest type of train in Romania as it stops in all halts and stations. It is also the cheapest train ride. Going back to the monasteries, you don't have to be a religious person to enjoy what you will see there. We've seen these monasteries before on several occasions in our childhood (school trips...) and we are not very religious ourselves, but we were still amazed by our recent trip in the region. The Dorna land in Suceava county is crossed by two rivers - Putna and Moldova. The Carpathian mountain massifs in the area are Giumalau (1,887 m), Rarau (1,653 m), Calim with the Pietrosu peak (2,100 m). 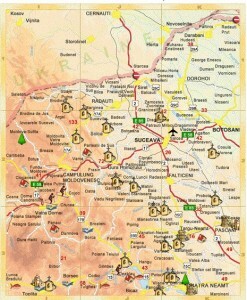 This is the area where you will find the Bucovina monasteries. 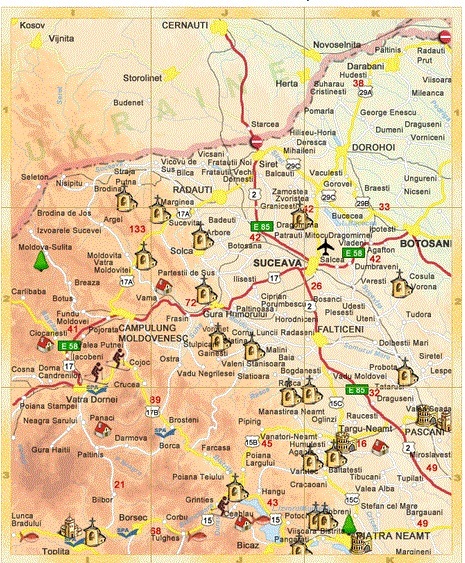 From Suceava going a bit north and north west, then traveling a bit back south (see the map here for an exact location) you can find the Bucovina monasteries. It is 39 km from Suceava. The monastery was founded in 1488 my Stephen the Great (Stefan cel Mare). This is known as Bucovina's jewerly. Its paintings were executed during the reign of Petru Rares (the son of Stephan the Great) in 1547. The monastery is known for its blue color of the exterior paintings, which has triggered its name 'Voronet blue'. 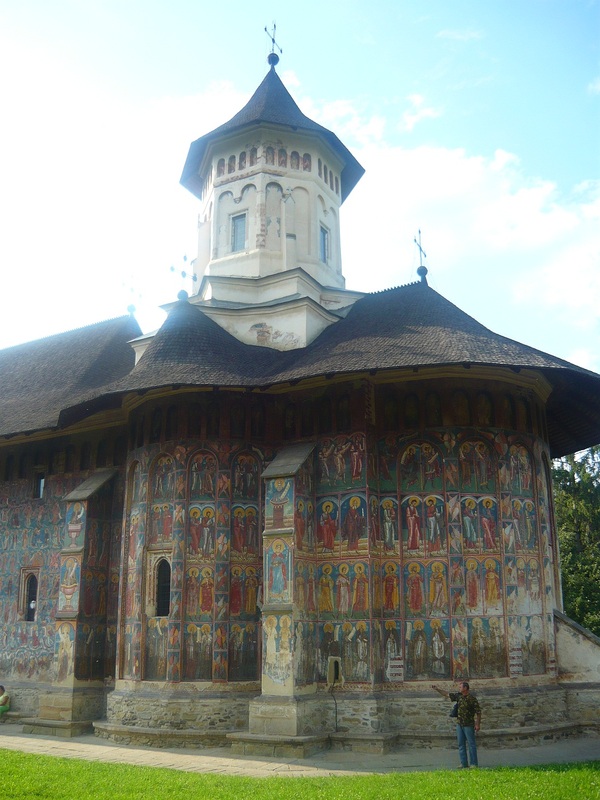 It is 94 km from Suceava, It was founded by Petru Rares (son of Stephen the Great) in 1532. The monastery is surrounded by walls with defense towers, like a small fortress. What is special about this church is that, along with paintings representing saints, you can also see paintings of representatives of the classical culture: Pitagora, Platon, Aristotel and Sofocle, who are considered predecessor of Christianity. It is 41 km from Suceava and was built in 1530. Its beginning was in 1415 and in 1527 the monastery was attacked and destroyed by Tatars. The ruins of the old monastery can be seen 300 meters from the newer church. 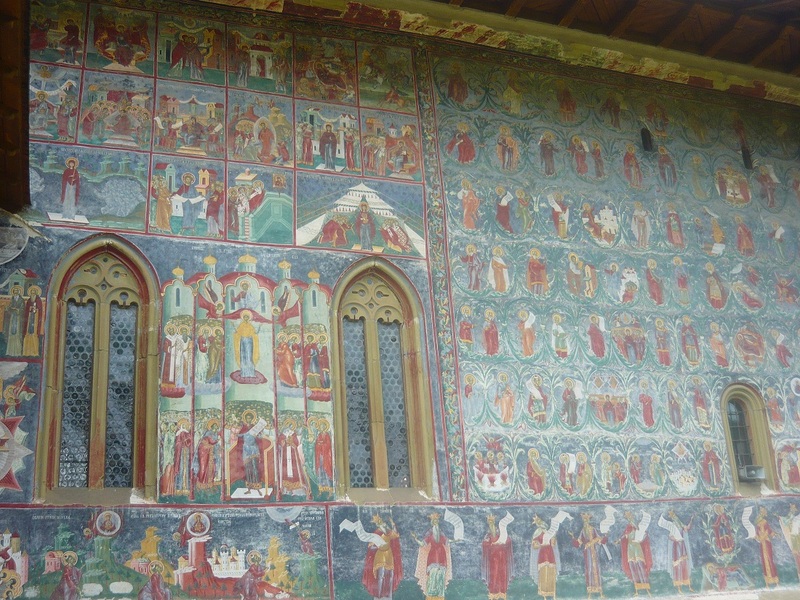 It is 32 km north west of Suceava and was built in 1503 by court nobleman Luca Arbore (hence the name of the church), who was also buried there. 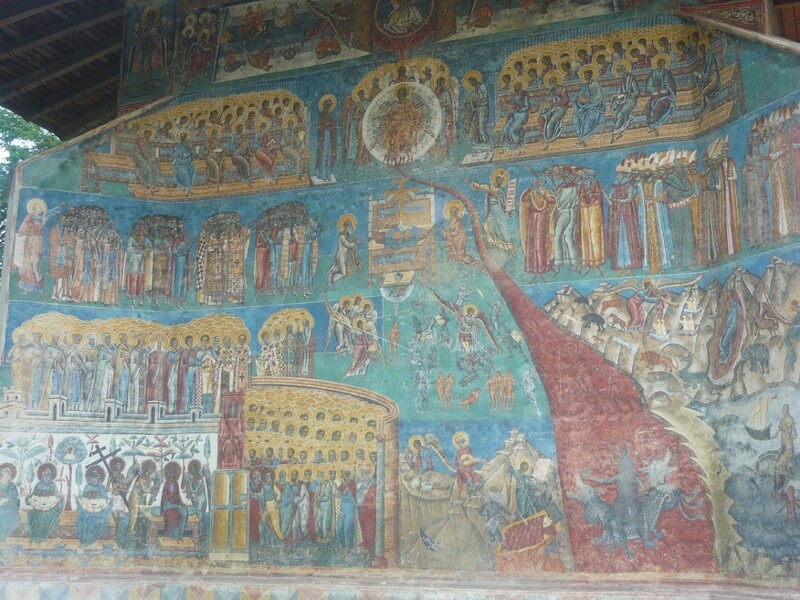 It is 69 km from Suceava was built by king Stephen the Great after the Chilia battle victory in 1465. The ruler was buried in this monastery. 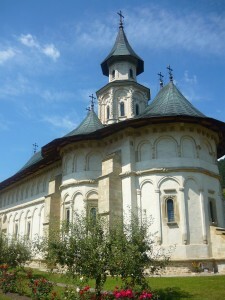 The church was finished at the end of 1469, but the campaigns that the voivode undertook in Transylvania, as well as the raids of the Tartars from 1469 and 1470 prevented him from dedicating it until1470. The church was re-built for three times in the 1600s. Legend says that Stephen the Great, having once been defeated and wounded in battle and wandering around the country, at last reached the dwelling place of Daniil the Hermit (Daniil Sihastrul), who gave him food and shelter. In the middle of the night, the hermit took Stephen by the hand and led him out of the cell, pointing towards a certain spot in the distance and asking him three times in a row whether he saw anything there. The third time, the voivode answered that he saw some lights, to which the hermit replied that those were not lights, but angels, and that the place is sacred. He added that, if he wanted to defeat his enemies, he should build a monastery on that very spot. *Accommodation facilities are available – either rooms for two with bathroom, or rooms for multiple guests. You can call father Elefterie to book a room (+40)753.020.673. Read more about the monastery here. 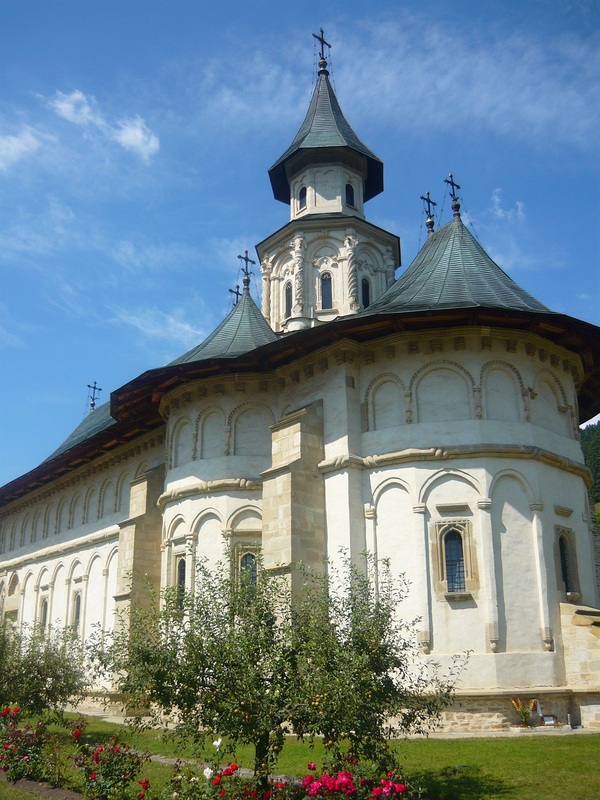 The proper tour of these monasteries can take a long day or even more. If you're planning to spend a night there, most of the monasteries offer their own sanctums for rent and they usually come cheap. You will also see how monks and nuns live and work there. 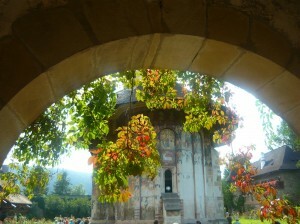 Each of these monasteries usually has small shops where you could buy paintings (icoane) and all sorts of church items. As a personal comment, a tour of these monasteries will show you that Romania, back when it was not unified, but divided into the three Principalities: Moldova, Ardeal, Tara Romaneasca, was a country which loved and cared for its natural, inherited beauties and a country where things happened (even if only when rulers were demanding it). Some of these monasteries were built and painted in just a year or two, when there were not wars (and there have been plenty of wars upon us...), and after that they were re-built over the years. Read more about these monasteries here.